Fragment of Chelyabinsk meteorite, showing the fusion crust -- the result of a previous collision or near miss with another planetary body or with the sun. Meteorites that fell to Earth when a fireball exploded over Russia earlier this year show evidence of earlier cosmic collisions, a new study reveals. Some fragments of the Russian meteor explosion over the city of Chelyabinsk on Feb. 15 — which injured more than 1,000 people — revealed melting and crushing that came from older impacts. The darkest black bits of the fragments showed traces of "high pressure loads sufficient to entirely crush the mineral grains and melt metallic material," the scientists said in a statement. The meteorite bits were a mélange of different types of silicate-rich ordinary chondrites, which are the stony meteorites that fall the most often on Earth. They ranged from light grey, showing very little evidence of space collisions, to dark black, where melted iron poured into the cracks that exist in silicate mineral grains. 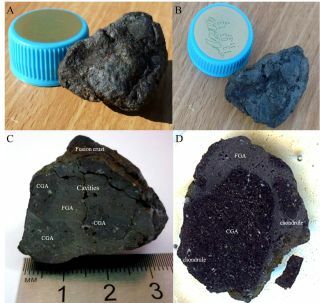 Under the microscope, the grayest meteorite fragments contained minerals such as pyroxene and olivine, researchers said. The black ones had "dark, featureless spectra" because the molten iron smudged the silicates' composition. The difficulty of identifying the darkest bits of meteorite may shed light on why it's hard to predict the composition of dark asteroids from afar, the researchers said. They added that it would be easier to send spacecraft to get a close-up view since the asteroids' spectra would be difficult to read from a distance. "The results are of special interest because they not only shed light on potentially hazardous impacts of asteroids on Earth, but also on more violent space collisions which disrupted ancient protoplanets in the early solar system into smaller asteroids we observe today," the scientists wrote in a statement. Results were presented today (Oct. 8) at the annual meeting of the Division for Planetary Sciences of the American Astronomical Society in Denver, Colo. Earlier this year, another science team said the melting they observed in meteorite fragments could have come from two possibilities: an earlier crash with an asteroid within the solar system, or melting from when Chelyabinsk's meteorite grazed the sun's sphere of influence.